Crosman is a US manufacturer with a proud history. Crosman are an American airgun and outdoor equipment company, that design and manufacture a range of pistols, rifles, pellets, and scopes all in the USA. Their base is in East Bloomfield, Rochester which is near to the East coast in the State of New York. Crosman also have several other highly popular brands which they produce airguns under, including Benjamin, and Sheridan. The Benjamin range or airguns are of a higher quality, and more aimed towards the hunting / pest control side of the market. Crosman first started production back in 1923, with the introduction of the ‘First Model’ rifle which was a pneumatic rifle. It used what was essentially a bike pump below the barrel, which pressurised the chamber, and this in turn fired the pellet along a rifled barrel. This weapon was of the first of its type, and Crosman has never forgotten this heritage, as a large percentage of their range today is pump up pneumatic rifles, although they no longer need to make use of a bike pump! Crosman are perhaps best known for their range of pest control rifles and pistols, such as the Crosman 2240 Rat Buster Co2 pistol, and their range of Ratcatcher rifles, namely the Crosman 2250b, and the newer Crosman 2250 XL. These are all powered off the 12g Co2 capsules that Crosman began experimenting with back in the 1930s. In 1954 they introduced the standard 12 gram capsule as we know it today, and are now a standard in almost all airgun manufacturers of today. Crosman also produce some ‘Big Bore’ airguns in calibres up to .357, making them immensely powerful and aimed primarily at the American market, although they are available in the UK with an FAC. One of their attempts was the Benjamin Rogue, which fired a .357 lead pellet at up to 1000 FPS making it immensely powerful. 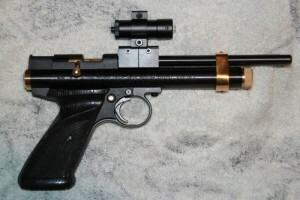 It also had an electronic controller for the firing mechanism which increased the shot count and consistency. The Crosman Ratcatcher Extreme XL is elegantly simple, and highly customisable. In my opinion though, you can’t really beat the Crosman 2250 Ratcatcher. The latest model, the 2250 XL, is a much improved model with a metal breech kit, and a longer barrel with a ½ inch UNF thread for fitting a silencer. The beauty of the 2250 is that it is so elegantly simple, with disassembly taking a few minutes, and a wealth of customizable parts available, which can be found on the internet. If you head over to GMAC Custom Parts, you can see the scale on which this apparent. There are multi-shot kits, new bolt and probe assemblies, and you can replace literally everything on the rifle for a custom part! It really is the rifle if you like tinkering and improving, as the possibilities are almost endless. Or, if you prefer something of a smaller size, the Crosman 2240 Rat Buster pistol is great, as it is almost exactly the same as the 2250, the only being difference being the inclusion of a smaller barrel. For instance, take a look at this Crosman 2240 (pictured) pistol where pretty much everything has been customised, apart from the Co2 tube! The Crosman 1077 RepeatAir is a fun, fast and easy to use air rifle. Powered by Co2 capsules, it’s as easy and loading the magazine, loading it into the rifle, and firing to your heart’s content. With a velocity of 6ft/lb, it has enough power for youngsters to play with, and for the learner. A rail is included for optics and other additions. Crosman 2240 air pistol. Credit: Carl, Lancs, England. Other Crosman air rifles which are particularly popular are the 760 Pumpmaster which is available in either Black or Pink, and as the name suggests, it is a pump air rifle which fires either pellets or BBs. The small frame size is ideal for juniors and female shooters, but can quite easily be used by adults as well, and is an excellent choice for teaching marksmanship skills as well as safe firearm handling. Crosman are also known for their ‘military’ style products, such as the Crosman MK-177, which has a tactical appearance, with its short frame length, weaver rails for accessories, and compact rear stock. This makes it a very quick handling rifle, and ideal for those who love action films. The MK-177 is just not a looker though, it can fire BBs and Pellets making it super flexible and ideal for plinking and target shooting. It works off the same pump up system as the 760 Pumpmaster does, making it ideal for juniors. 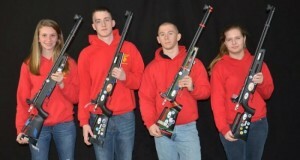 Top Shooters Win JROTC Championship With Challenger. Image Credit: Crosman. However, don’t think that Crosman just produce airguns aimed at the hunting and plinking side of the market, as they also have a long standing reputation for producing good quality target rifles and pistols. For example, their target rifles are regularly used in competitions, and the teams very regularly win. To learn more, check out the National Championships last year in America where the whole team were using Crosman Challenger Rifles. A firm favourite of pistol target shooters over here in the UK is the Crosman 2300T, which is a CO2 powered pistol, based on the 2240, but with a longer competition barrel, and high quality sights, making it ideal for those wanting to start in target shooting, or teach it to beginners. Just recently Crosman have released a new product under their Benjamin line called the Pioneer Airbow, and instead of a barrel that fires pellets, it fires arrows from a tube from an airgun based platform. The idea behind this is that you can use a scope, and finely adjust the trigger just like you can on a normal air rifle, to achieve the same high level of accuracy. Unfortunately it’s not available in the UK, but I think it’s pretty cool and shows the innovation that Crosman have. To learn more about Crosman products, head over to their collections page now. Or check out their full range of Crosman air rifles and accessories on their brand page. You can learn more about them on our Crosman collections page. Or head to their official site to learn even more.